Initial teaching include 3 periods of 2 days, on the base of 6 hours a day. Since 2002, to answer the demands and the needsof practitioners trained in the method Moneyron, every year, three days of « Meetings », take place in Ambert, in Auvergne (France). This post-gradual formation is opened to the practitioners trainedby Françoise Moneyron. Its purpose is to dive back at the heart of the method and to go even further to the perception, the therapeutic gesture and the experiment. A certificate of capacity in the method is given to every participant. For dates and towns, browse to schedule. Contact us or fill in the form. Formations are made by Françoise Moneyron. She is at the moment accompanied on every training course by a trainer, introduced by her(his) care and having a practice regularly according to the method. 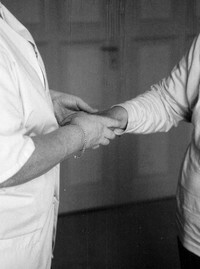 Taking part of the seminaries requires at least a training as physiotherapist. * Only the students having attended all the sessions will be given a training certificate.